Burt DeGroot was considered as one of the founding fathers of Southern California Indoor Volleyball. He was a successful coach in four decades from the 1940s to the 1970s; As a player-coach he won U.S. Air Force Titles in 1946, 47 and 48. He then coached the Far Eastern Armed Forces Championships in 1957, 58 and 59 along with U.S. Air Force Worldwide titles in 1953, 54, 58, 59 and 1960 and National Inter-service crowns in 1954, 58 and 1959. Beginning in 1961 at Santa Monica College he won 4 straight USVBA College Titles from 1961-64. He stopped coach SMC in 1965 to become Dean of Student Services. In the late 1960’s he coached with Harlan Cohen at the Westside Jewish Community as his son David started playing indoor volleyball. In 1973 DeGroot and Cohen helped start the Pepperdine program He was assistant coach for the first USA Olympic Team in 1964. He helped his son David to be an All-American setter at UCSB and USVBA College Champion. 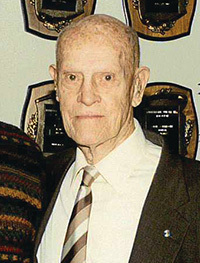 The Illinois-born DeGroot won the USVBA’s ‘Leader in Volleyball’ award in 1950 and a special U.S. Air Force award in developing and promoting volleyball (1953-60). He was inducted into the International HOF in 1990 and died at age 96 on October 13, 2003.